We have been left all too few recordings of Kathleen Ferrier's inimitable voice but this outstanding complete English version of Bach's greatest passion is indeed a treasure-trove. It personifies the style and traditions of a past age in Bach performance and is also a tribute to Dr Reginald Jacques who was bold enough to perform and record the first complete version of this work. The soloists were also deeply steeped in English pre-war choral tradition so the performance is another worthy window on the past in different ways. There is also a certain hallowed air about this recording, a sense of discovery and sacred affection for the music that only arises from spontaneity. Most period-performance purists will definitely rule this re-issue out-of-court for its solemn pondering and clearly embellished scoring, but to my mind no recording of this ubiquitous Passion comes closer to the heart of Bach's divine conception. Ferrier is simply outstanding in the title role, her vocal declamation and fiery portrayal of the anguish and suffering that she herself was to experience is chillingly convincing. She is matched however by an outstanding team of soloists, all of which are in direct or close contact with her heart-rending agonizations. None is more convincing than Elsie Suddaby, a deeply committed and authoritative Bachian interpreter. She is more than a match for Jacques' ponderous tempi and her shaping and inflexion in her many arias are shatteringly spiritual and inspired. Alan Blyth rightly singles her out for praise in his booklet essay. Blyth also recalls the nostalgic effect that Eric Greene and Henry Cummings used to have in their innumerable performances of this Passion at Eastertide in years gone by. Both artists are completely at one with the various tragic musical permutations and their lifelong experience of singing this magnificent work is never in doubt. I cannot praise the wonderful singing of the Bach Choir too highly, such is their rapt spirituality and alert attendance to all matters choral. This was indeed an ensemble trained to the highest standards of artistic perfection by their inspired conductor and leader. I have already muted the point that the old-fashioned portamentos and melodic shaping by the Jacques Orchestra can tend to be slightly boorish, but there is no doubt of their affection for the piece. In many ways, this recording reminds me of Sargent''s outstanding 1946 ''Messiah''; a similarly no-holds-barred traditionalist performance with unashamed use of a full orchestra and handpicked choir, a companion piece if there ever was any. The English text may be a deterrent for the purists, but it certainly helped me to understand the work better. 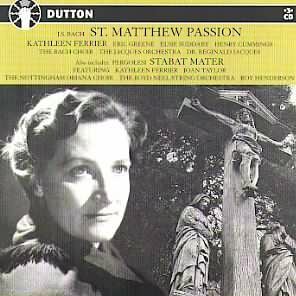 As if this was not enough, Dutton have resurrected another legendary performance in the shape of a rare Pergolesi ''Stabat Mater'' recorded in 1946. This time Ferrier is accompanied with outstanding dignity and persuasiveness by Roy Henderson and the Boyd Neel strings, an underrated conductor who was especially good in small-scale baroque works. Indeed his conducting contains some controversial tempi, that work to the increase of excitement and effect of this undeniably awe-inspiring composition. Joan Taylor is the accompanying soloist and she is the ideal partner to Ferrier's distinguished voice, here in full maturity and prime. Dutton are offering this 3-disc set at the price of two and this added incentive makes for a wholehearted recommendation. As a parting note, it would be appropriate to praise the fine sound secured by Kenneth Wilkinson and Victor Olof, both giants of their time and representatives of the golden age of Decca recordings. An outstanding memorial of Kathleen Ferrier, one of those select group of legends 'whom the Gods love'.